Capture the spirit of the young Church with this beloved contemporary Mass setting by Steve Angrisano and Tom Tomaszek. This is the keyboard/unison accompaniment book for Mass of a Joyful Heart, a revised Mass setting by Steve Angrisano and Tom Tomaszek. Originally commissioned for the National Catholic Youth Conference, the revised edition of this beloved contemporary Mass setting captures the spirit of the young Church with fun, upbeat rhythms and accessible melodies filled with joyous enthusiasm. Working closely with pastoral musicians to create a singable and approachable piece of music, Steve and Tom have combined familiar themes with new elements that faithfully present the new Roman Missal. They have also added a setting for the Penitential Act, a Lenten Gospel Acclamation, as well as a simple approach for all Gospel acclamation verses! 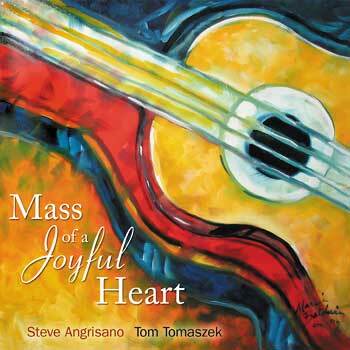 This is the guitar/unison accompaniment book for Mass of a Joyful Heart, a revised Mass setting by Steve Angrisano and Tom Tomaszek. Originally commissioned for the National Catholic Youth Conference, the revised edition of the beloved Mass of a Joyful Heart captures the spirit of the young Church with vibrant, upbeat rhythms and accessible melodies filled with joyous enthusiasm. Plus, enjoy a special bonus track—"Psalm 40," by Steve Angrisano! Steve Angrisano and Tom Tomaszek have masterfully combined familiar themes with new elements that faithfully present the new Roman Missal. By popular demand, they've also added settings for the Penitential Act and Lenten Gospel Acclamation. The simple, melodic approach for the Gospel verses work wonderfully with the Alleluia, providing a consistent setting for all occasions. Offering FREE lyric sheets, links to LicenSingOnline.org for downloadable assembly editions and music reprint permissions for worship aids, as well as links to two videos—providing insights and suggestions for use in worship—this enhanced CD helps you introduce this setting to your parish with ease. Do you have an intergenerational congregation? Need a Mass setting for your Catholic school choir or university ensemble? Appealing to all ages and arranged for the average parish musician, Mass of a Joyful Heart gives you a contemporary and prayerful way to celebrate the liturgy. This is the MP3 playlist for the enhanced CD Mass of a Joyful Heart. Bring music to life with the Mass of a Joyful Heart choral guitar book—featuring accessible choral arrangements and guitar chords to help you share this beloved contemporary Mass setting with your community. Upbeat and fun, this Mass of a Joyful Heart captures the spirit of the young Church through contemporary rhythms and easily accessible melodies. Originally commissioned for the National Catholic Youth Conference, this beloved Mass setting was composed by Steve Angrisano and Tom Tomaszek who wanted to craft an approachable set of songs with familiar themes that faithfully present the texts of the Roman Missal, Third Edition. Mass of a Joyful Heart also includes a special setting for the Penitential Act, a Lenten Gospel acclamation and simple approaches to the Gospel verses that work wonderfully with the Alleluia, providing a consistent setting for all occasions. Plus, enjoy a special bonus track: "Psalm 40," by Steve Angrisano! The enhanced CD version includes free lyric sheets and links to LicenSingOnline.org for downloadable assembly editions, two supplemental worship aids with insights and suggestions for use in worship, and reprint permissions—everything you’ll need to introduce this Mass setting into your parish celebrations with ease. Perfect for intergenerational congregations, or even your Catholic school choir or university ensemble, Mass of a Joyful Heart is appealing to all ages and arranged for the average parish musician, giving you a contemporary and prayerful way to celebrate the liturgy.